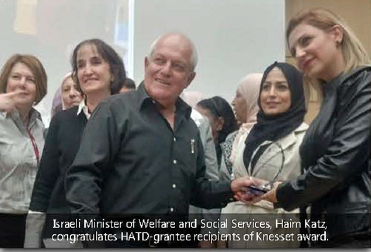 A top Knesset prize was recently awarded to HATD-grantee, Beterem, for its outstanding service to the community. The award’s recipients, a group of grandmothers from the Arab town of Turan in northern Israel, were presented the prize for their achievements in saving children’s lives through an innovative child-safety program initiated and funded by HATD. The prestigious “Prize for Innovation in Social Services” is awarded annually by the Israeli Ministry of Social Welfare to a select group that exemplifies excellence and innovation in addressing challenges faced by Israeli society. The prize is an especially important mark of HATD’s achievement in combatting alarmingly high rates of child injuries in Arab communities in Israel, where children are four times more likely to be involved in accidents than their Jewish counterparts. In addition to saving children’s lives, the program serves a critical component of supporting women’s empowerment by enabling grandmothers to transcend traditional gender roles to which they are often confined in traditional societies. Ms. Iman Shehade Darawshe, who oversees the program’s volunteers, explains, as agents of change, the grandmothers are given lifesaving skills and the power to impact their communities for the better along with serving as role models for women and girls of all ages. Beterem has also facilitated the women’s engagement at the policy level and the grandmothers have advocated for adoption of the program by the local municipality. 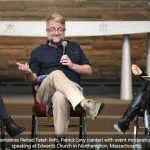 This is not the first time that this HATD-backed program was officially recognized for the lifesaving work it does. In the summer of 2017, Beterem placed second at a world competition on safety projects at a conference held in the United States. On the heels of the remarkable success and recognition of the Turan grandmother’s program, HATD launched a second grandmothers program this past fall in the Israeli city of Carmiel with grant funding from the Jewish Federation of Western Massachusetts.